What Is the Standard Business Card Size and Why Shouldn’t You Stray From Using It? 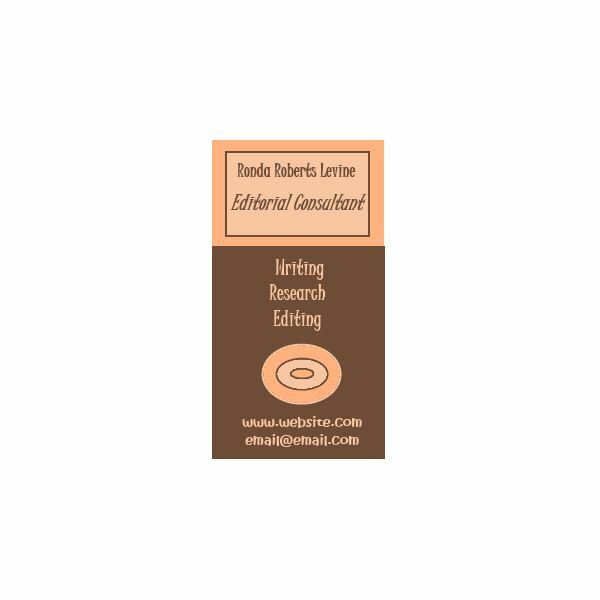 Standard business card size is 3.75 inches by 2.25 inches, allowing for a 1/8th inch bleed and a 1/8th inch no print area. 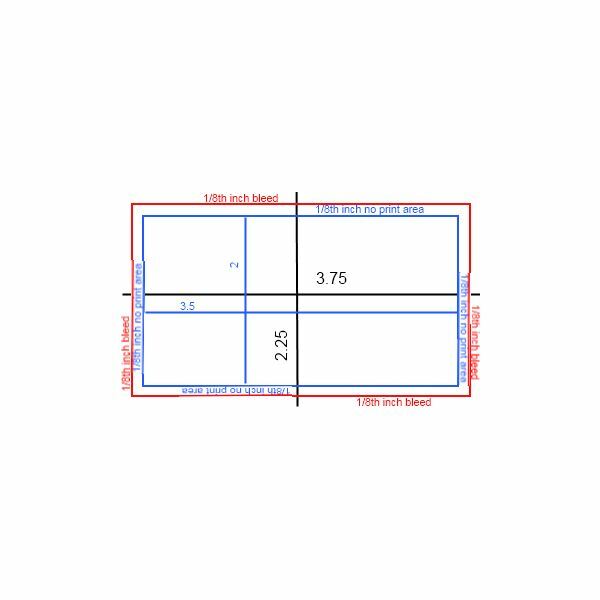 The final dimensions for your card design will be 3.25 inches by 2 inches. With such a small printing area, it can be difficult to determine whether all the necessary information will be able to fit on the card. However, you should fight the temptation to vary the size of your business card. By varying the size of your card, you can undermine your efforts to ensure that the recipient of your card can easily access your contact information. A guide template for the standard business card size has been provided in the media gallery for your download and use. For one, by creating a business card that is larger or smaller than the standard size, you are creating problems for those who receive your card when it comes to placing the card in a wallet or rolodex. Second, while some people now scan business cards, the scanner may only accept business cards that are of the standard size. When creating your business card, it is important to keep this practicality in mind. Third, by keeping to the standard size for business cards, you can demonstrate to your prospective clients and contacts that you can make good use of space – this is especially important for graphic designers on their business cards. While the space on standard-sized business cards is small, there are various tips for creating business cards meant to help you maximize the space you do have to work with. 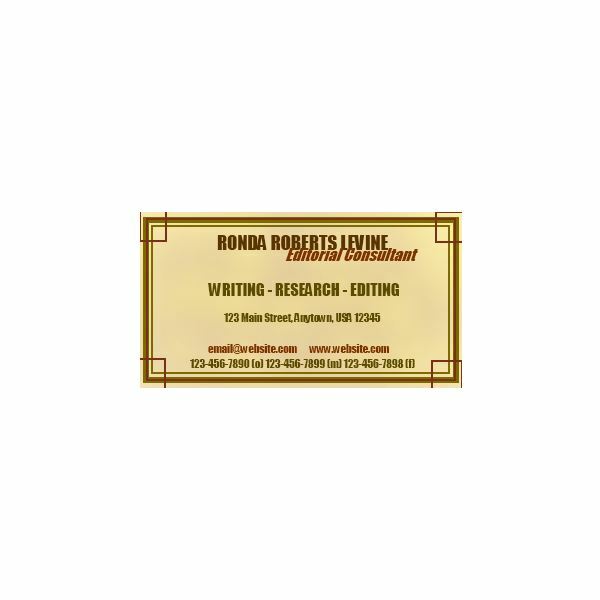 If you use the front and the back of your business card, you can automatically double the space available. This can be especially useful if there is a lot of information you wish to convey on your card. For instance, if you wish to highlight the name of your company, you might do this on one side and then have your contact information on the other side. Alternatively, you can use one side for your contact information and use the other side to provide a quotation or website for download of supporting material. In the business card to the right, a dark background with bright colors were used to engage the recipient of the card. 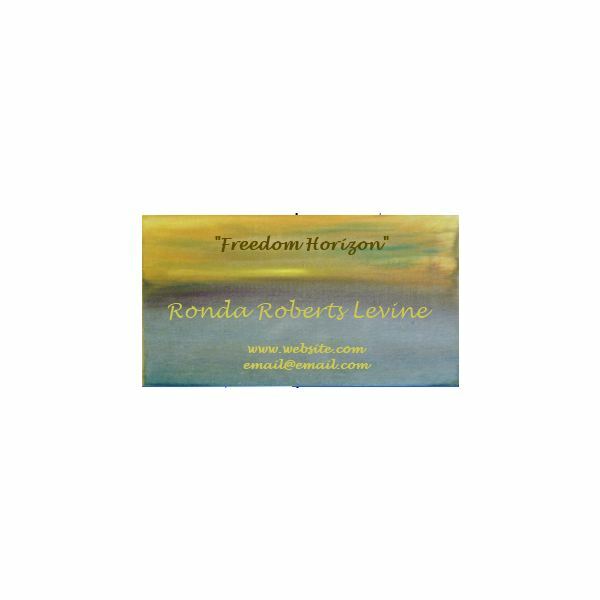 On the back, the name of the business appears while on the front side of the double-sided business card, information and a free offer is presented. Foldover business cards can be another great way to convey a lot of information in a short amount of space. When designing foldover business cards, it's important to keep some rules in mind. First, keep the front and back of the card consistent with each other and the inside. You should have a theme that runs through the entire card. With the foldover business card template provided for your download and use in the media gallery, a consistent color theme runs throughout the template. 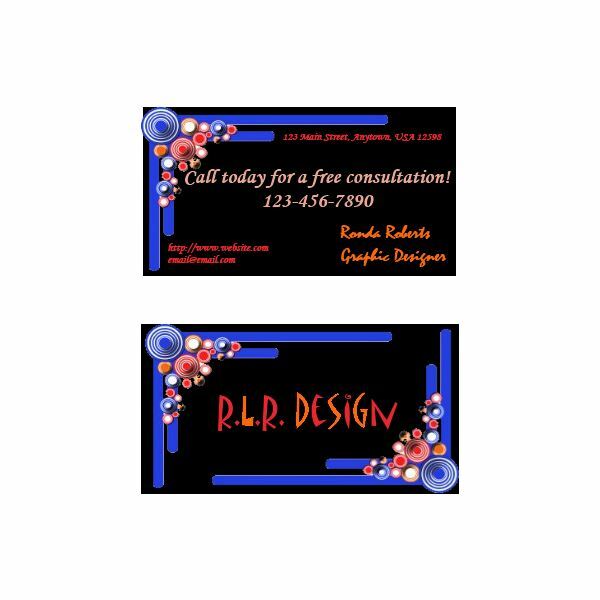 In the example created with the template to the left, you can see that you can keep your business card to the standard business card size, but that you can be creative with placement in order to allow you to include a quote or a place to write down an appointment time on the inside or back as well. For marketing purposes, you may even consider including a coupon or special incentive for those with your business card. Sometimes one of the ways to cope with a small business card standard size is to keep it simple. While many people interpret "simple" as being black ink on white paper, it doesn't have to be. It is possible to ensure that all of your basic information has been included on the business card and have an exciting card. In the example card to the right, you can see that the standard business card size has not hindered the ability to include all the relevant contact information that makes it easy for prospective clients or customers get in touch with you. Just as the template for the card to the right uses geometric patterns and color to make a splash, you can use color and simple patterns to create a custom card that adheres to the standard business card size limits. Sometimes you want to showcase artwork, but you don't want to print on both sides of the business card for whatever reason. This can be a great option if you're looking to keep your costs down, or if you're trying to make the artwork the focus of the business card. When you have a busy background, for say such a card, then you will want to keep the information on the card simple – limiting it to perhaps the name of the artwork, the name of the artist, and the website and email (or phone number) for the artist. At the most, you would also include the gallery where the artwork was being displayed at on the card. When working with business card sizes, it's important that you know when to break the rules and when to stick to protocol. 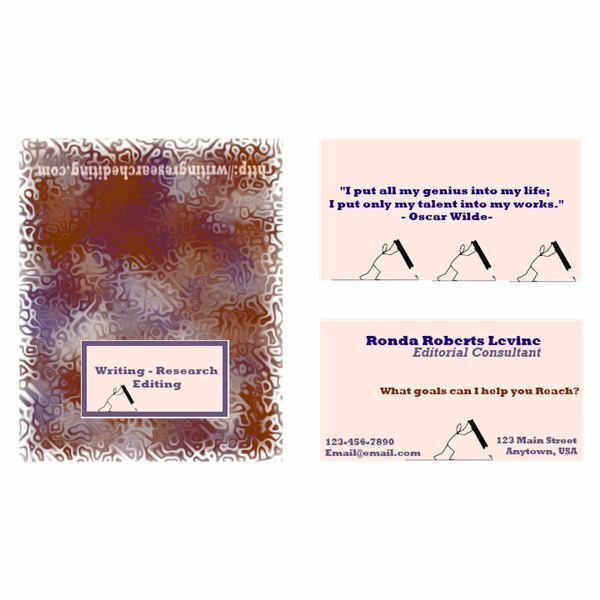 For example, you can tip the business card so that it's being used lengthwise as with the sample to the right. In the media gallery, a template for this card has been provided for your download and use. Sometimes, though not often, you can get away with using alternatives to business cards. Some people use coasters, for example, as replacements for business cards. This might be appropriate if you run a bar or an event supply company. It would not be appropriate for someone in academia or the law profession. Finally, remember that your business card should also express your personality. Don't be afraid to create a custom business card that expresses yourself and your personality fully. It will make it easier for those you distribute your cards to to recall who you were, if your card is unique.